Ask fellow campers about "Fort Caspar Campground" and nearby attractions. Access to the park was easy with good signage. Access road to the park was paved. Park roads are dirt/gravel and in very rough condition. Check in was quick, pleasant and informative. We chose this park because it was one of the few still open this late in the season. We requested a Power only site and that's all we paid for. When we arrived at our site we discovered that all services were available. We only needed and wanted the electric so that's all we used. I did request a wider site as we have opposing slides. I don't think my request was well received as we did get a bit of a wider space but we were parked right next to the garbage bin. The park was maybe 25% occupied. She could have done much better. Every time the lid slammed our dog went nuts. Our site, as well as all the rest, was nothing but a gravel parking lot. It did NOT come with a table, fire pit or patio. Services supplied were power and cable. We did not use the washrooms but did poke our heads in. They were clean, modern and well maintained EXCEPT.... There were NO doors for the toilets. There was just a shower curtain. The shower stalls did not have any privacy either. Had we needed to use theirs, we would have been most upset. There are no restaurants or services within walking distance. A shopping center is a few blocks away. We paid $29.70 with tax inc G S discount. We did not feel that we received good value. We would not return. We camped at Fort Caspar Campground in a Motorhome. There is not much in Caspar but there is a museum right next door. It was small but okay. National Historic Trails Interpretive Center is well worth the visit. It is free and very well done. We also took a drive to Independence Rock. A bit of a drive but we felt it was worthwhile. Price includes taxes and a Good Sam discount. Our third time to Fort Casper but only because it is close to family members. Solid 50 amp electric and good water pressure. A lot of full-time residents in fact, I think the majority of the park are folks here long term. Most people obey the 5 MPH speed limit but there are those who do not and they kick up a fair amount of dust. Very close side-by-side parking with nothing between sites. WiFi is free but the reception is off and on depending on the time of day. Good Verizon LTE service and you wouldn't have a problem getting a satellite signal here. All that being said, I think we will check out another park in the area, especially given the price they are charging for basic RV parking. We camped at Fort Caspar Campground in a Motorhome. Given the amount of full-timer's here (and they are adding more all the time) I would call way in advance for a reservation. Highly recommend you visit Independence Rock and the Hand Cart Museum that is about 5 miles or so to the west of the Rock. Pull through and back-in FHU sites. Also have tent sites. Looks like a lot of full timers, but it was quiet and well kept. The "back-in" sites in the center were a bit confusing as we were told two RV's should fit in one section, but we are 50' combined between the RV & truck, and took up both sites. The water & electric were both good; we had WiFi and cable. The sites are all gravel with no grass. They have three very small dog parks, but there is river walk trail, which was very nice. 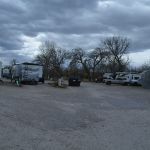 We camped at Fort Caspar Campground in a Travel Trailer. I've stayed here for 4 summers (4-6 months at a time) - good people, fair rates (Casper in general is not cheap), cable included & electric (summertime). Reasonably large spaces, good office staff. They are serious about keeping bathrooms/laundry clean! We camped at Fort Caspar Campground in a Fifth Wheel. Need service on a rv? Contact Outlaw RV - great mobile service. Good eats at "the office" and "guadalajara". We pulled in late to Fort Caspar Campground. When I called the reservation in, I told them we'd be arriving later. They told me "no problem" they would have the information on the office door. They did, and a nicely marked out map on which site was ours and the route through the campground. Nice clean restrooms and showers. Good WiFi. However, no grass to be found in the center section of the campground, the middle rows are basically a gravel parking lot with hook ups. Nice and level, but didn't strike me as a place to camp and relax. We were traveling through and this worked fine for us. A bit pricey for the sites. We camped at Fort Caspar Campground in a Motorhome. I agree with the earlier review about this place being under rated. We paid the weekly Good Sam rate of $264 for a 50 amp FHU site with cable and wi-fi. Decent cable lineup of about 50 stations. The sites here have some breathing room. There is enough room to park your toad next to the RV. That was a very nice change from the places that pack you in. They allow RV washing if you ask. Great quiet location right near the N Platte River. Wi-fi was mostly very good. Yes it is a gravel lot, but it is level with decent sized sites. We had a problem with our front rooftop AC units fan breaking apart. We called Outlaw RV with great results. We camped at Fort Caspar Campground in a Motorhome. Best bet for something to eat and a cold one is J's Pub & Grill. HH is M - F, 3 - 6. The Baja Beach is a local smoking dive with a great HH of two for one drinks, M - F, 5 - 7. Great friendly local crowd. Both are close by. Move on! One of the most disappointing parks we have hit in our travels. the price is very high for a run down gravel parking lot. There are so many full time trailers and most are run down with plywood windows. The dog run at the end has so many weeds in it my little dog would have gotten lost. Not sure why the park has dog runs because every other tenant has there own dog runs and we were woke up in the middle of the night several nights in our week stay by barking dogs that were left outside. The laundry facilities were the only thing that gets an A it was cheap and clean but I do not think I would return to this park even for an over night stay. Verizon was good. We camped at Fort Caspar Campground in a Motorhome. Fort Caspar is next door and the drive to the Waterfall is worth the drive. Dirty, lots of flies,dumpster overflowing, a lot of older trailers that haven't moved in years. Would rather stay in a Walmart parking lot. We camped at Fort Caspar Campground in a Motorhome. All gravel sites (level) power boxes in poor condition. Dusty and in general could use some general maintance and upkeep. Cable is spotty. WiFi is not existent. We were told that both cable and wi fi are going to be upgraded in the future. We camped at Fort Caspar Campground in a Motorhome. National Historic Trails Interpretive Center is close by. Old town Casper is a nice stroll down Main Street. Very old facility, out of the way. We stayed for two nights. Nothing much to do at this park. Very limited groceries/supplies at the office. We camped at Fort Caspar Campground in a Fifth Wheel. Casper is a very difficult city to navigate. 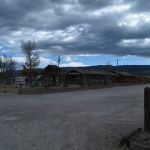 The only thing close to this RV Park is Fort Caspar which was interesting to visit. 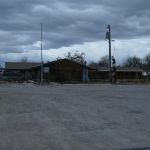 There are no eating or shopping facilities close to this RV Park. There are no tables or fire rings available. It's almost like parking in a big gravel parking lot. Location is not convenient to Interstate 25. No outside garbage cans, by your RV, are permitted and dumpsters are not conveniently located either. Park all flat gravel with wide spaces. No shade or tables. View of mountains. Fish pond, fenced dog area. Very nice walk/bike path next to park. 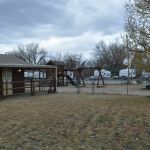 We camped at Fort Caspar Campground in a Travel Trailer. Clean park. Interior gravel roads were easy to navigate in a 38' MH and the pull through was long enough for rig and attached tow. Site was almost level and did not use jacks as we were only staying one night. Water and electric connections were good. Satellite TV reception was good as the sites are all open. Wifi was good for an RV Park. Verizon phone and data was average. We camped at Fort Caspar Campground in a Motorhome. We stopped for one night on the way to Colorado. It's a big gravel parking lot but certainly adequate. Satellite hooked up no problem as there are no trees and we had a good Verizon signal. Was just fine for one night pass through. We camped at Fort Caspar Campground in a Motorhome. Good overnight place to stay. A lot of residents & a lot of over nighters too. Verry nice people in office & staff. Long narrow Pull through sites. Very low outside noise level. Campground is all gravel, sites & roads. Wide roads make it easy to get in & out of camp sites. Washer / dryer clean & good operation. 1.75 & 1.00 Campground entrance / exit has big rock that must be careful to navigate around. Doable & keeps traffic slow. Would stay again for a couple nights. We camped at Fort Caspar Campground in a Fifth Wheel. Park is nothing special, but a decent overnight spot. Gravel everything, but sites are level, long, and spacious. Plenty of permanents that the owners should have clean up around their coaches. Friendly office staff. No cable, but plenty of air channels. Park is a little confusing to find since it's in an industrial area. They have a huge bolder separating the entry and exit road, so be careful when entering and especially leaving. There is a sign posted to swing wide so you'll have enough clearance to miss the bolder. We camped at Fort Caspar Campground in a Fifth Wheel. We tried River's Edge first but they were full, it seems the oil workers have taken it over. Easy access to downtown Casper, and while the Mall is a ways away, freeway and main street access makes the trip easy. There are also several top notch RV dealers and service centers in the area which is nice. Casper is a great center for historic sites - all major westward migrations in the 1800's passed right through here. When arriving, there is a dip at the entrance. Go slow. If you are going to be here a while, get a air filtering machine. A lot of dust! The Pioneer Interpretive Center on the north end of town was wonderful. The Tate Paleo museum was amazing, and free. Never did find a good restaurant other than Eggingfon's which was too expensive. National Historic Trails Interpretive Center is fantastic! $6 adult and we spent 2 hours. Good meal at Sherrie's Place, short drive to 310 West Yellowstone Hwy. Drove up Casper Mountain to Rotary Park and enjoyed time at the beautiful waterfall. Are you affiliated with Fort Caspar Campground ?